Footy Promotions will be hosting a visit from a representative from Langley Boarding School in the United Kingdom. 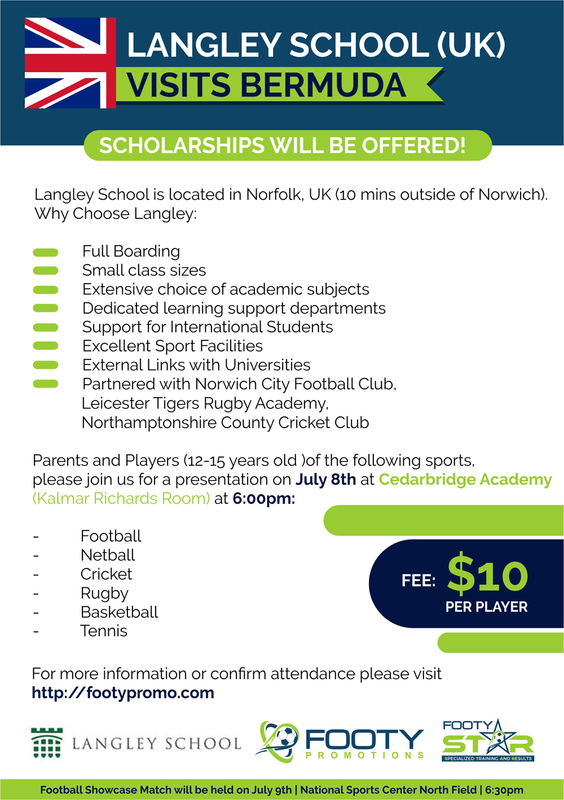 “We are inviting players [12-15 years old] from the following sports to join us for a Langley School Presentation and Q&A session on Sunday July 8th at 6pm hosted at the Cedarbridge Academy [Kalmar Richards Room],” the organisation said. “There will be football showcase for the 12-15 year old age group which will take place on Monday July 9th at 6:30pm [North field - National Sports Centre]. Players will be able to showcase their talents in front of the Langley School representative to earn a scholarship award.